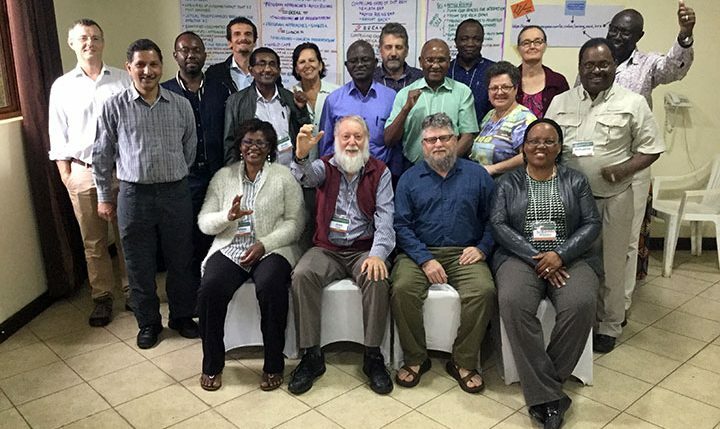 SIMLESA–Africa RISING joint learning event. Photo credit: Jonathan Odhong’/IITA. If you had a once-in-a-lifetime opportunity to talk to a policymaker about systems research in agriculture/sustainable intensification (in sub-Saharan Africa), its value, and why it should be funded, what relevant case studies, high line results, and lessons learned would you share to get a positive response? This was the question posed recently to a group of agricultural researchers at a joint learning event on sustainable intensification/farming systems research approaches. Convened by the United States Agency for International Development (USAID) and the Australian Centre for International Agricultural Research (ACIAR) on 13–15 March, in Arusha, Tanzania, the meeting sought to roll out the process for distilling common denominators in terms of impact, lessons learned, and value from Africa RISING, the Sustainable Intensiﬁcation of Maize-Legume Cropping Systems for Food Security in Eastern and Southern Africa (SIMLESA), and the Feed the Future Innovation Lab for Collaborative Research on Sustainable Intensification (SIIL) programs. “We hope to see a common vision for systems research starting to emerge from this meeting. This does not mean that activities of the three programs have to be identical, but it would be nice to know in which areas each program is operating, geographically and the principles and strategies they are using. This information will help us improve coordination and better explain our work to the funders at USAID and ACIAR,” said USAID senior sustainable agricultural systems advisor, Jerry Glover, at the opening of the meeting. For two and a half days, participants examined the approaches used by the three programs in implementing research-in-development activities in different countries; distilled the important common/desired elements for systems research programs; teased out lessons learned about systems research; evaluated policy, market and institutional changes for effective sustainable intensification; documented compelling cases where systems research has made a difference; and also brainstormed on low-cost areas for joint action between SIMLESA, Africa RISING, and SIIL going forward. To highlight the intricacies of systems research in agriculture for sustainable intensification, ACIAR principal advisor for cropping systems, John Dixon, noted that the complexity of systems research/sustainable intensification is best illustrated by the universally acclaimed success story of the Green Revolution. “For many decades, people [most of us] thought that the Green Revolution was a magnificent success without downsides. We are now recognizing that the essential successes of the Green Revolution which were absolutely needed to feed Asia [at the time], came at a huge environmental cost. In fact, in India, China, and other Asian countries there is a huge run-down of the environment, aquifers, underground water, the soils, and biodiversity. We also see a lot of other externalities, for example, the news that Beijing is the most polluted city in the world; now it seems that New Delhi has been granted that mantle. And that is connected back to agriculture. So in this example, the ‘S’ part of SI (which stands for sustainable) has been neglected at the expense of the I part (intensification). Was it neglected in research or did researchers not pay attention to things like natural resources, to water, etc. ?” he posed. 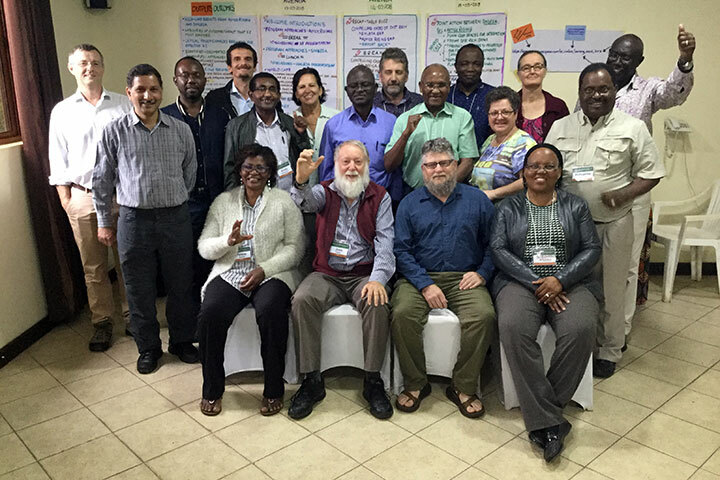 While broad consensus and common understanding/appreciation of progress in systems research/sustainable intensification developed among participants as the meeting unfolded, a few sticky points also emerged that will form the basis of discussions in future joint learning events. These included: the need to establish common definitions for terms like “reach”, “use”, “adoption”, etc. ; approaches to scaling as an integral part of research-in-development action; measuring risk and establishing metrics for systems resilience; data management challenges/opportunities, and integration of plot-level interventions into the landscape level. At the close of the meeting, participants also pored over the future possibility of setting up a multi-donor platform that would bring together different donors and stakeholders involved in systems research in agriculture for sustainable intensification. A key output from this meeting (expected to be finalized by June 2018) will be a synthesis document articulating the progress and achievements of systems research/sustainable intensification in Africa that will be shared with all key stakeholders and donor agencies.